↑ "National Library of Medicine - Medical Subject Headings (MeSH) - Ganglion Cyst". Archived from the original on March 10, 2016. สืบค้นเมื่อ August 27, 2013. ↑ "E-hand.com The Electronic Textbook of Hand Surgery". The American Society for Surgery of the Hand assh.com. Archived from the original on March 9, 2014. สืบค้นเมื่อ April 12, 2014. 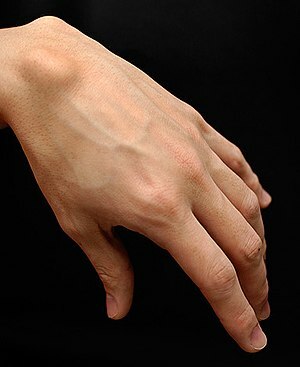 ↑ 3.00 3.01 3.02 3.03 3.04 3.05 3.06 3.07 3.08 3.09 3.10 3.11 3.12 "Ganglion Cyst of the Wrist and Hand-OrthoInfo". orthoinfo.aaos.org. March 2013. Archived from the original on 6 July 2017. สืบค้นเมื่อ 10 June 2017. ↑ 4.00 4.01 4.02 4.03 4.04 4.05 4.06 4.07 4.08 4.09 4.10 Ferri, Fred F. (2014). Ferri's Clinical Advisor 2015 E-Book: 5 Books in 1 (in อังกฤษ). Elsevier Health Sciences. p. 472. ISBN 9780323084307. Archived from the original on 2017-09-10. ↑ 5.0 5.1 Cooney, William P. (2011). The Wrist: Diagnosis and Operative Treatment (in อังกฤษ). Lippincott Williams & Wilkins. p. 1089. ISBN 9781451148268. Archived from the original on 2017-09-10. หน้านี้แก้ไขล่าสุดเมื่อวันที่ 24 มกราคม 2561 เวลา 12:13 น.